Raise Your Voice for Renewables! The following post is by Emily Miller from from Flintridge Sacred Heart Academy. On the morning of March 30th, I met up with Sophie Korn, ACE Educator, at LA City Hall to express our support for the LA City Council to vote for the funding of renewable energy through a rate hike from the Department of Water and Power. 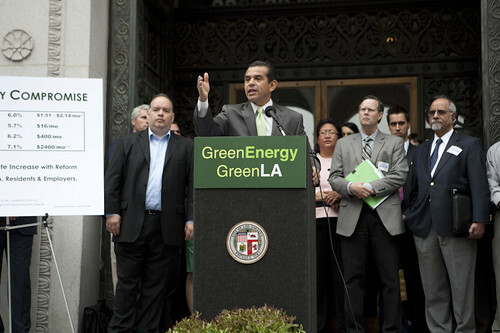 Los Angeles Mayor, Antonio Villaraigosa, addressed concerned citizens about the Green Energy Compromise for nearly half an hour. I have seen Mayor Villaraigosa in the news, but seeing him in person made me feel like I was a real citizen of the Los Angeles - who was going to be affected by his decisions. It was almost unreal seeing the Mayor of Los Angeles in person! I realized then that we are all in this together. We have to work together in order to bring change. After the mayor gave his empowering speech, a cameraman from the Mayor's office asked me why I was at City Hall. I was there because I supported the funding of renewable energy. Even if the prices of water and energy services have to rise, now is the time to invest in renewable energy. We need to stop our dependency on fossil fuels such as coal. I was there on Tuesday because LA needs to start being powered by clean energy. We then found our way into the City Hall, it was so exhilarating to be involved in policy. As an activist it was good for me to have this experience and see a little bit of how our government works. After waiting for about an hour, the crowd started to die down and the officers were opening the actual chamber for us to go in. I was able to go inside the chamber where citizens could make comments and address the City Council. It was quite an unforgettable experience. I felt so empowered that I was one of the youngest activists there. The Green Compromise passed! I am so grateful for the opportunity I had to witness LA take a step towards a sustainable future. This is just the beginning. I encourage everyone to become a responsible citizen. Let your city council know what is important to you. Help bring change. You can do it. 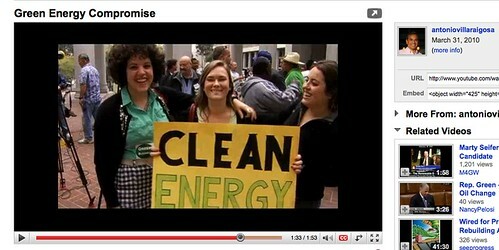 Left to right: Sophie, Emily and Jenny Binstock from GreenPeace on the Mayor's Youtube channel! 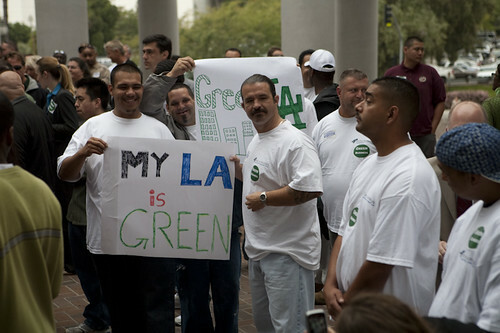 Citizens of Los Angeles RAISING THEIR VOICES to LOWER OUR EMISSIONS! Photos courtesy of Tae Lim and Zack Kenner.